The facelifted Ford EcoSport was revealed last year just before the Los Angeles Motor Show in the USA. It was evident back then that Ford was planning to get the updated EcoSport to India at some point of time to compete with the likes of the Maruti Suzuki Vitara Brezza and the Mahindra TUV 300. 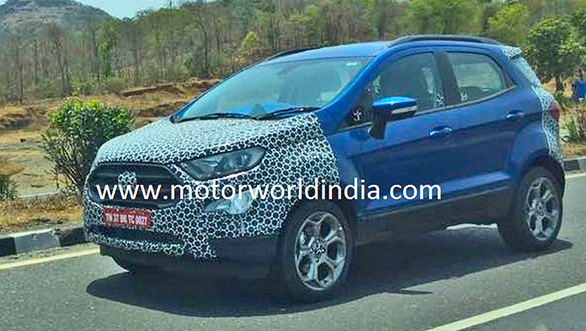 And now test mules of the 2017 Ford EcoSport have been spotted doing rounds in Chennai hinting at a festive launch this year. 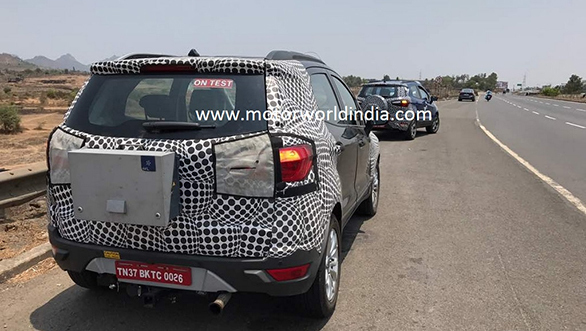 The front and the rear sections of the 2017 Ford EcoSport test mules are camouflaged as that is where the compact SUV gets major changes. The bonnet features cleaner profile lines. The facelifted model features a new single-piece hexagonal grille with twin slats running along its width. The headlight design too has been revised with a larger profile. In addition, it also comes with projectors along with LED DRLs. The front bumper has got muscular contours and comes with new and large fog lamps that appear better than the ones offered in the present model. 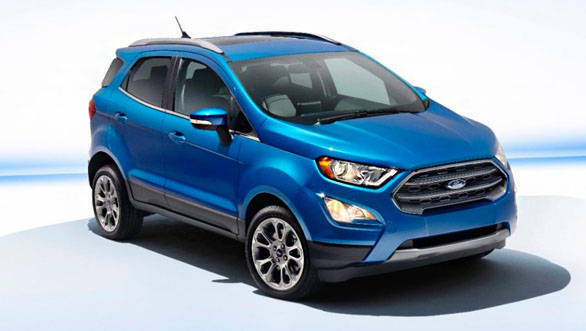 The changes in the design have made the upcoming iteration of the EcoSport look sportier than the present. This can also be seen with the new alloy wheels that look larger in profile. The rear profile gets minimal changes and will continue to sport tailgate-mounted spare wheel. We believe Ford will also update the interiors of the EcoSport with the facelift model. While the dashboard, steering, instrument cluster will get changes, the highlight of the cabin will be the new 8-inch SYNC3 infotainment system which features Apple CarPlay and Android Auto and also come with navigation. In terms of entertainment, the Ford EcoSport facelift will be offered with a 675-watt, 10-speaker B&O Play system with subwoofer. The powertrain options that will be doing duty on the Ford EcoSport facelift are the 1-litre Ecoboost petrol as well as the 1.5-litre, 100PS TDCi diesel and petrol engines that are offered in the current model. We believe with the facelifted EcoSport, Ford will take on its staunch rivals like the Maruti Suzuki Vitara Brezza, Honda WR-V as well as other crossovers like the Hyundai i20 Active. Ford India will also be exporting the new EcoSport to the US where it debuts early 2018. The Ford EcoSport will be positioned below the Escape and will be the company's most compact crossover.